Objective: The objective of the study was to evaluate the effectiveness of chitosan and chitosan-ethylenediamine tetraacetic acid (EDTA) (3:1,1:1,1:3) in comparison with 5.2% sodium hypochlorite (NaOCl) in disinfecting Enterococcus faecalis biofilm on root canal dentin and in the removal of smear layer with minimal erosion. Materials and Methods: Seventy single-rooted extracted human mandibular premolars (n = 70) were selected for the study. Forty tooth samples were biomechanically prepared, vertically sectioned, and sterilized by autoclaving. The tooth sections were artificially infected with E. faecalis (ATCC 29212 [n = 35] and clinical isolate [SBEF2, n = 35]) to form mature dentinal biofilm in vitro. The tooth samples were treated with the test solutions: chitosan and chitosan-EDTA (3:1, 1:1, 1:3), and the killing time was determined. The smear layer removal ability of the test solutions (Group A: chitosan-EDTA [1:1], Group B: EDTA, Group C: control) (n = 10 tooth/group) was assessed. Results: Chitosan and chitosan-EDTA (3:1, 1:1, 1:3) exhibited antibacterial activity against both the strains of E. faecalis. Chitosan and chitosan-EDTA caused 3 log reduction in the viable count of the sessile cells of E. faecalis at 15 min while 5.2% NaOCl exhibited 99.98% inhibition at 15 min. Chitosan-EDTA (1:1) was found to be effective in removing the smear layer and showed lesser erosion than EDTA at the coronal and middle portions. Conclusion: Chitosan-EDTA (1:1) is a potential root canal irrigant that performs a dual role – root canal disinfection and smear layer removal. Microorganisms and their toxic metabolites play a major role in pulp and periradicular pathosis. The success of endodontic treatment lies on the effective eradication of the bacterial biofilm from the infected root canal system.Enterococcus faecalis is documented to be the most dominant species that persist in endodontically treated teeth.,E. faecalis is reported to remain viable, proliferate, and establish a biofilm phenotype that is highly resistant to phagocytosis, antibodies, and antimicrobials than nonbiofilm-producing organisms. The microbiological goal of endodontic treatment is to reduce the bacterial bioburden in the root canal to levels that are compatible with tissue healing  Irrigants and intracanal medicaments form a necessary adjunct that enhances the antimicrobial effect of mechanical cleansing and thus augments overall clinical efficacy. Owing to its pronounced antimicrobial activity and its exceptional capacity to dissolve pulp tissue and organic components of the smear layer, sodium hypochlorite (NaOCl) still remains the irrigant of choice. Ethylenediamine tetraacetic acid (EDTA) is a potent Ca 2+ chelator and removes the inorganic layer. Previous reports have demonstrated the combined effect of EDTA (10–17%) and NaOCl (2.5–5%) in removing the organic and inorganic debris. A final rinse with hypochlorite has long been recommended to flush out the residual effect of EDTA. However, a final flush with NaOCl accelerates deeper erosion of the dentinal walls. Chitosan is a biopolymer derived by the partial deacetylation of chitin obtained from crustacean shells. The antibacterial property of chitosan is due to the electrostatic interactions between NH 3+ of chitosan that binds to bacterial cell surface components and alters the cell permeability and hence results in the leakage of intracellular components and cell death., Although previous studies have documented the antimicrobial activity of EDTA-chitosan acetic acid on planktonic cells of E. faecalis ATCC29212, their action on dentinal biofilms has not been explored. Hence, the present study (research hypothesis) was designed to compare the antibacterial efficacy of chitosan and chitosan-EDTA with 5.2% NaOCl against E. faecalis biofilm on root canal dentin and to assess the smear layer removing capacity. In addition to the standard strain, E. faecalis ATCC29212, a clinical strain of E. faecalis (SBEF 2), isolated from a posttreatment root canal infection was included for artificially infecting the tooth samples so as to mimic the actual scenario in a root canal treatment (RCT) failure. This study has been reviewed and approved by the Institutional Ethical Committee approval number SBDCECM104/12/18. Two strains of E. faecalis, a clinical strain (SBEF 2) isolated from a posttreatment root canal infection with the ability to form a biofilm, and a standard strain, ATCC29212, were included in the study. Sampling was done using sterile paper points, and the sample was transported to the microbiology laboratory in microfuge tubes containing sterile Brain Heart Infusion Broth (Hi-Media Pvt Ltd., India). Primary isolation was done on blood agar plates (supplemented with 5% sheep blood) and MacConkey agar plates were in alpha hemolytic and magenta pink-colored colonies were grown, respectively, followed by biochemical confirmation according to Facklam and Collins 1989. The biofilm forming ability of the clinical strain was confirmed by tissue culture plate method. Chitosan (12 mg/ml in 0.1% acetic acid) (Panvo Organics Limited, India), 17% EDTA (pH 7.3), and three combinations of chitosan-EDTA (1:3, 1:1, 3:1) were tested against E. faecalis. 5.2% NaOCl (Vishal Dentocare Pvt Ltd., India) and saline were included as the positive and negative control, respectively. Vancomycin (30 µg) (HiMedia Pvt Ltd., India) was included as the standard as it is the conventional antibiotic used in the treatment of enterococcal infections. Antimicrobial activity of the test solutions against E. faecalis was assessed by agar well diffusion assay. The minimum inhibitory concentration (MIC) was determined by Broth microdilution method. Minimum concentration of the test solution that inhibits ~99% of bacterial growth on the Mueller–Hinton agar (HiMedia Pvt Ltd, India) plate was scored as the minimum biocidal concentration (MBC) of the respective test solution. Seventy freshly extracted intact, noncarious, single-rooted human mandibular premolars with fully formed apices (n = 70) were chosen for the study. Forty tooth samples were sectioned and used for the biofilm assay while thirty tooth samples were used to assess the efficacy of chitosan/chitosan-EDTA in smear layer removal. Briefly, the tooth specimens (n = 40) were sectioned below the cementoenamel junction with a diamond disc to obtain a standard tooth length of 8 mm. A size 10 k-file was used to scout and establish patency till the tip of the file was seen at the apical foramen, from which 1 mm was subtracted to establish the working length. The samples were then instrumented with ProTaper rotary system in a crown-down technique. Two milliliters of 3% NaOCl was used as the working solution during instrumentation. The apical third of each canal was prepared up to size F3 to allow adequate flushing and penetration of the irrigating solution. After instrumentation, teeth were sectioned vertically along the mid-sagittal plane using a fine grit diamond disc. The concave tooth surface was minimally grounded using diamond disc. The vertically sectioned tooth samples (n = 80) in groups of five were sterilized by autoclaving. Sterility check was performed by incubating the sterilized tooth samples in Mueller–Hinton broth (MHB) for 48 h at 37°C and was observed for turbidity if any. The vertically sectioned tooth samples were transferred aseptically into the wells of sterile tissue culture plates in two sets of seven groups (n = 5) each – Group I: 17% EDTA (pH 7.3), Group II: chitosan, Group III: chitosan-EDTA (1:3), Group IV: chitosan-EDTA (1:1), Group V: chitosan-EDTA (3:1), Group VI: hypochlorite (5.2%), and Group VII: saline. One set was inoculated with fresh cultures of E. faecalis ATCC 29212, and the other was seeded with E. faecalis SBEF2 (cell density 1.5 × 108 cells/ml) in MHB. The plates were incubated at 37°C for 6 weeks. Sterile MHB was replaced every alternate day. The tooth samples were rinsed with saline twice to remove the planktonic cells. The biofilm formed on the root canal dentin was exposed to the respective test solutions (×6 MIC against the planktonic cells) as the MIC of the biofilm phenotype is usually much higher compared to their planktonic counter parts  and control. The viable count was assessed at regular time intervals (0, 15, 30, 45, 60 min) by pour plate method as it is the recommended quantitative culture method to estimate the viable bacterial count. Killing time (KT) values in minutes were recorded. The E. faecalis biofilm on the root canal dentin was immersed in the respective test solutions (Groups I–VI) and saline (Group VII) for 24 h at 37°C. After incubation, the tooth samples were fixed in 10% formalin. The gold-sputtered samples were examined under scanning electron microscope (SEM) at 29 KV to detect dentinal surface changes. Thirty freshly extracted, single-rooted human premolars were randomly divided into three groups of ten each, depending on the final irrigant used – Group A ( chitosan-EDTA [1:1]), Group B (17% EDTA [pH 7.3]), and Group C (control - no final irrigant). After instrumentation with 5.2% NaOCl, each canal was rinsed with the respective irrigants for 5 min, followed by 5.2% NaOCl and sterile distilled water. The teeth were longitudinally bisected into buccal and lingual parts by wedging process after a shallow groove preparation by fine grit diamond disc. One-half of each sample was fixed in 10% formalin for 24 h. The samples were mounted on a copper stub, vacuum dried, and coated with gold (Auto fine coater JEOL JFC-1600). The gold-sputtered samples were examined under SEM at 29KV. Based on the final irrigant used, the specimens were coded – Group A: chitosan-EDTA (1:1) (A1 through A10), Group B: 17% EDTA (B1 through B10), and Group C: sterile water (C1 through C10). Scoring was performed independently by three endodontists in a blinded manner. Scores (1 - no smear layer, 2 - moderate, 3 - heavy) were attributed based on the presence/absence of smear layer at the coronal, middle, and apical portion of each canal. Furthermore, the degree of erosion of dentinal tubules was independently scored as Score 1 - no erosion, Score 2 - moderate and Score 3 - severe. Statistical analysis was performed using SPSS version 21 (IBM Corp, Armonk, NY). The comparisons of the mean scores of smear layer removal and erosion scores between the groups were analyzed by Kruskal–Wallis test and Mann–Whitney test was used for pairwise comparisons. Interobserver variability of the scores was assessed by Fleiss kappa test. [Table 1] shows the antibacterial efficacy of the test solutions against E. faecalis. Agar well diffusion assay revealed that EDTA did not exhibit antibacterial activity while chitosan showed a discrete zone of inhibition against both the strains of E. faecalis. Further, when EDTA was combined with chitosan, an incremental gradation was observed in the zone size with increasing concentration of chitosan [Table 1]. Controls (vancomycin [30 µg] and 5.2% NaOCl) showed inhibition zones of the expected size [Table 1]. Multiple comparisons by post hoc tests showed that the antibacterial activity of chitosan and chitosan-EDTA (3:1) against E. faecalis ATCC29212 was equivalent to that of vancomycin (P = 0.578, P = 1.000, respectively). Although the antibacterial activity of chitosan-EDTA (3:1) against the E. faecalis clinical isolate was higher than vancomycin (P = 0.007), no statistical difference was observed in the activity of chitosan and chitosan-EDTA (1:1) compared to vancomycin (P = 0.798, P = 1.000) [Table 1]. The MIC/MBC values of the test solutions were same for both the E. faecalis strains, except chitosan-EDTA (1:1) [Table 1]. The KT of chitosan-EDTA combinations (1:1, 3:1) was calculated to be 60 min for both the strains of E. faecalis. However, KT of chitosan was 60 min and 24 h for E. faecalis ATCC29212 and SBEF2, respectively. Chitosan-EDTA (1:3) demonstrated anti-biofilm activity against E. faecalis strains only after overnight incubation. E. faecalis ATCC29212 and SBEF2 were significantly rendered nonviable (%survival, 0.02%) after a very short (15 min) exposure to the conventional root canal irrigant, 5.2% NaOCl. Nevertheless, chitosan and all chitosan-EDTA combinations exhibited a 3 log reduction in colony-forming unit of E. faecalis ATCC29212 and SBEF2 within 15 min [Figure 1]a and [Figure 1]b.
SEM analysis revealed that the surfaces of root canals and the dentinal tubules in the coronal and middle thirds in Groups A and B were free of debris [Figure 2]. Comparison of the mean scores Groups A, B, and C showed a statistically significant difference in the amount of debris remaining at coronal (A vs. C, P = 0.006, B vs. C, P = 0.006) and middle level (A vs. C, P = 0.006, B vs. C, P = 0.006) while no significant difference was found between Groups A and B at the coronal level (P = 0.4602) and middle level (P = 0.3783) [Table 2]. Erosion was noted on the root canal surfaces in the Group B. A significant difference was observed in degree of erosion at the coronal level between Groups A and B (P = 0.0268). Chitosan-EDTA (1:1) caused lesser erosion in the middle sections compared to EDTA though the difference was not statistically significant (P = 0.2358) [Table 3]. 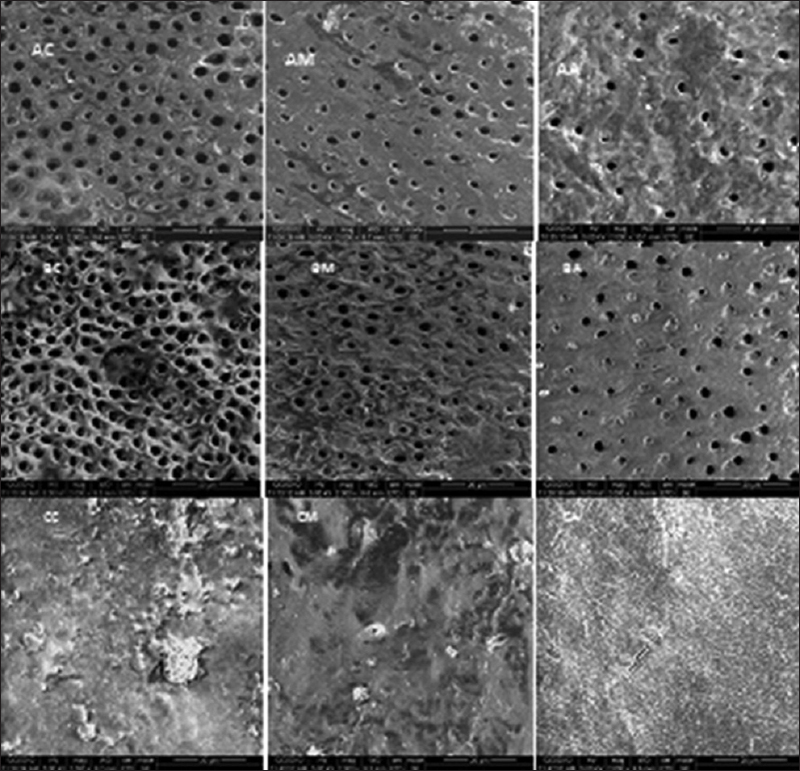 The resistance of E. faecalis biofilm could be attributed to a range of inherent microbiological factors, the anatomical complexity of the root canal system, and the structure of dentin., During the E. faecalis – dentin interaction, sediments with increased levels of calcium carbonate and calcium phosphate are formed in 6 weeks that corresponds to reprecipitation of apatite on the microbial biofilm. Hence, a potent root canal irrigant should efficiently clear a thick, mineralized biofilm of E. faecalis formed on tooth substrate. Based on the time-kill assay, we found that a short-term exposure (15 min) to chitosan either alone or in combination with EDTA (1:3, 1:1, 3:1) (%survival, 0.2–0.79%) produced a significant reduction in the number of E. faecalis (ATCC29212, SBEF2) cells adhering to dentin and was comparable to that of 5.2% NaOCl. A previous study has reported that a KT of 40 min for chitosan acetic acid-EDTA combination to kill the planktonic cells of E. faecalis However, in our study, was found to chitosan-EDTA (1:1, 3:1) to completely eradicate the E. faecalis dentinal biofilm in 60 min while hypochlorite exhibited biocidal activity at 30 min. This difference could be attributed to the difference in activity of chitosan-EDTA (1:1) against E. faecalis mineralized biofilm. Our results showed that chitosan-EDTA (1:1) causes significant reduction in the viable count of the biofilm phenotype. Thus, it could be speculated that EDTA potentiates the antibacterial activity of chitosan by facilitating its entry into the bacterial cell. EDTA and chitosan are known to restrain the growth of microorganisms by inhibiting various enzymes , Further, binding of chitosan causes potential extraction of lipoteichoic acids that eventually leads to a cascade of events resulting in cell death. Within the limitations of this study, chitosan-EDTA (1:1) is a potential root canal irrigant that performs a dual role – root canal disinfection and smear layer removal. Byström A, Sundqvist G. Bacteriologic evaluation of the effect of 0.5 percent sodium hypochlorite in endodontic therapy. Oral Surg Oral Med Oral Pathol 1983;55:307-12. Kayaoglu G, Ömürlü H, Akca G, Gürel M, Gençay Ö, Sorkun K, et al. Antibacterial activity of propolis versus conventional endodontic disinfectants against Enterococcus faecalis in infected dentinal tubules. J Endod 2011;37:376-81. Molander A, Reit C, Dahlén G. The antimicrobial effect of calcium hydroxide in root canals pretreated with 5% iodine potassium iodide. Endod Dent Traumatol 1999;15:205-9. Portenier I, Haapasalo H, Orstavik D, Yamauchi M, Haapasalo M. Inactivation of the antibacterial activity of iodine potassium iodide and chlorhexidine digluconate against Enterococcus faecalis by dentin, dentin matrix, type-I collagen, and heat-killed microbial whole cells. J Endod 2002;28:634-7. Distel JW, Hatton JF, Gillespie MJ. Biofilm formation in medicated root canals. J Endod 2002;28:689-93. Siqueira JF Jr., Rôças IN. Polymerase chain reaction-based analysis of microorganisms associated with failed endodontic treatment. Oral Surg Oral Med Oral Pathol Oral Radiol Endod 2004;97:85-94. Dutner J, Mines P, Anderson A. Irrigation trends among American Association of endodontists members: a web-based survey. J Endod 2012;38:37-40. Grawehr M, Sener B, Waltimo T, Zehnder M. Interactions of ethylenediamine tetraacetic acid with sodium hypochlorite in aqueous solutions. Int Endod J 2003;36:411-7. Niu W, Yoshioka T, Kobayashi C, Suda H. A scanning electron microscopic study of dentinal erosion by final irrigation with EDTA and NaOCl solutions. Int Endod J 2002;35:934-9. Rabea EI, Badawy ME, Stevens CV, Smagghe G, Steurbaut W. Chitosan as antimicrobial agent: applications and mode of action. Biomacromolecules 2003;4:1457-65. Raafat D, von Bargen K, Haas A, Sahl HG. Insights into the mode of action of chitosan as an antibacterial compound. Appl Environ Microbiol 2008;74:3764-73. El-Sharif AA, Hussain MH. Chitosan-EDTA new combination is a promising candidate for treatment of bacterial and fungal infections. Curr Microbiol 2011;62:739-45. Facklam RR, Collins MD. Identification of Enterococcus species isolated from human infections by a conventional test scheme. J Clin Microbiol 1989;27:731-4. Toledo-Arana A, Valle J, Solano C, Arrizubieta MJ, Cucarella C, Lamata M, et al. The enterococcal surface protein, Esp, is involved in Enterococcus faecalis biofilm formation. Appl Environ Microbiol 2001;67:4538-45. Berber VB, Gomes BP, Sena NT, Vianna ME, Ferraz CC, Zaia AA, et al. 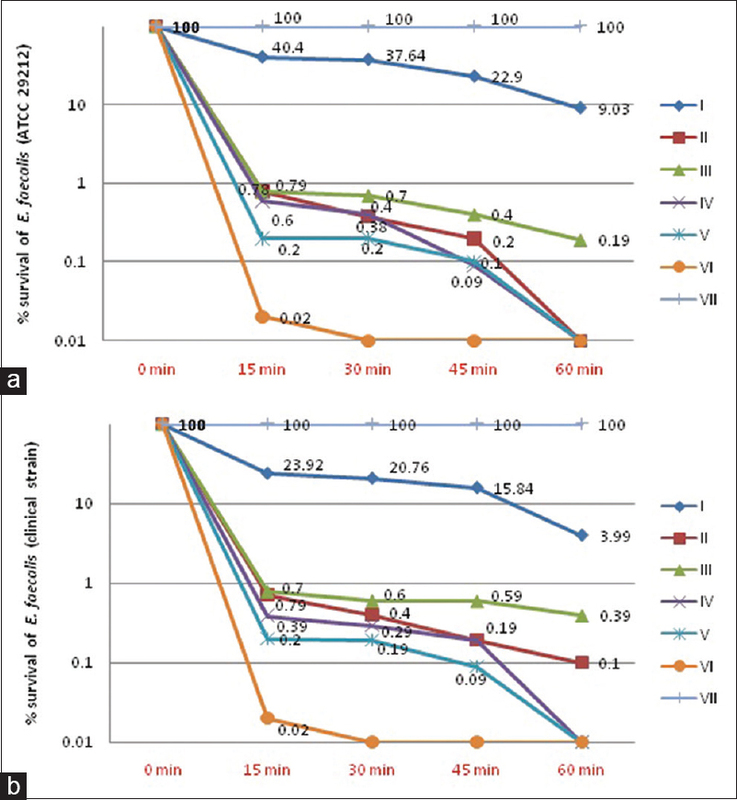 Efficacy of various concentrations of NaOCl and instrumentation techniques in reducing Enterococcus faecalis within root canals and dentinal tubules. Int Endod J 2006;39:10-7. Prabhakar J, Senthilkumar M, Priya MS, Mahalakshmi K, Sehgal PK, Sukumaran VG. Evaluation of antimicrobial efficacy of herbal alternatives (Triphala and green tea polyphenols), MTAD, and 5% sodium hypochlorite against Enterococcus faecalis biofilm formed on tooth substrate: an in vitro study. J Endod 2010;36:83-6. Kishen A, George S, Kumar R. Enterococcus faecalis mediated biomineralized biofilm formation on root canal dentine in vitro. J Biomed Mater Res A 2006;77:406-15. Gavini E, Sanna V, Juliano C, Bonferoni MC, Giunchedi P. Mucoadhesive vaginal tablets as veterinary delivery system for the controlled release of an antimicrobial drug, acriflavine. AAPS PharmSciTech 2002;3:E20. Torabinejad M, Khademi AA, Babagoli J, Cho Y, Johnson WB, Bozhilov K, et al. A new solution for the removal of the smear layer. J Endod 2003;29:170-5. Banin E, Brady KM, Greenberg EP. Chelator-induced dispersal and killing of Pseudomonas aeruginosa cells in a biofilm. Appl Environ Microbiol 2006;72:2064-9. Raad I, Hanna H, Dvorak T, Chaiban G, Hachem R. Optimal antimicrobial catheter lock solution, using different combinations of minocycline, EDTA, and 25-percent ethanol, rapidly eradicates organisms embedded in biofilm. Antimicrob Agents Chemother 2007;51:78-83. Reardon DM, Warner B, Trowbridge EA. EDTA, the traditional anticoagulant of haematology: with increased automation is it time for a review? Med Lab Sci 1991;48:72-5. Vaara M. Agents that increase the permeability of the outer membrane. Microbiol Rev 1992;56:395-411. Ramachandran Nair PN. Light and electron microscopic studies of root canal flora and periapical lesions. J Endod 1987;13:29-39. Nair PN. On the causes of persistent apical periodontitis: a review. Int Endod J 2006;39:249-81. Del Carpio-Perochena A, Bramante CM, Duarte MA, de Moura MR, Aouada FA, Kishen A. Chelating and antibacterial properties of chitosan nanoparticles on dentin. Restor Dent Endod 2015;40:195-201.